In this newsletter we like to share with you some of our designs that have special and powerful quotes. These quotes, when contemplated and focus upon can bring the wearer hope, courage, wisdom and positive attitude to life.
" Cowardice is the worst of all measures. Fear is the gate that the fool opens and the wise locks. When fear sneaks behind you, know it is a creation of your thoughts. Clean your thoughts and fear will vanish. Only then will your life become valid. What is within you will bring you life. What is not within you will bring you death. " The text explains that fear comes from ignorance. Fear twists your real perception and judgment. Fear is summoned by the person himself by letting deceiving thoughts and feelings grow in one's mind. Fear causes the feared one to become blind to the beauty and abundance of life. 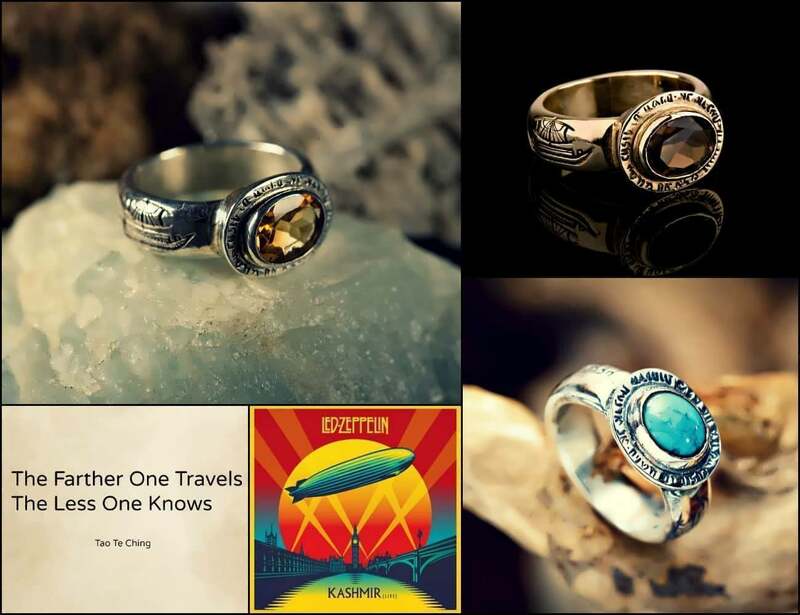 The Hebrew engraving around the stone means - " Father of the four winds fill my sails across the sea of years ", a sentence taken from the Led Zeppelin song - Kashmir. On one side of the ring appears the phrase " The farther one travels the less one knows " (written in Hebrew). This phrase was taken from the book of the "Tao Te Ching" written by the famous ancient Chinese truth seeker Lau Tsu. The sentence is taken from the book Ecclesiastes written by King Solomon. King Solomon was aware of the cyclical nature of things and wrote this phrase with a Buddhist mindset. The I Ching, like King Solomon, shows us how small we are in relation to the processes occurring in the universe, how ever at the same time it empowers us with knowledge so we can better understand our surroundings and our existence. 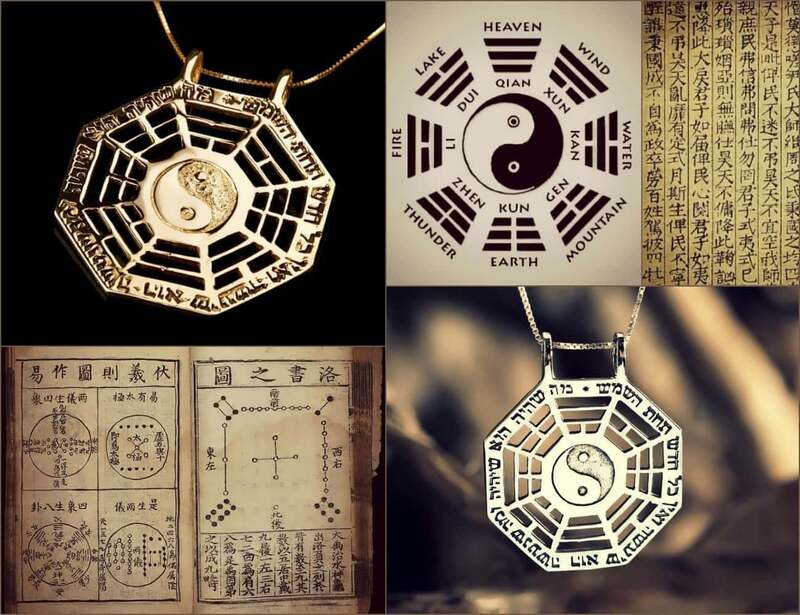 The I Ching pendant gives the wearer the understanding of the human place in the universe and the ability to attain great knowledge and power in life. 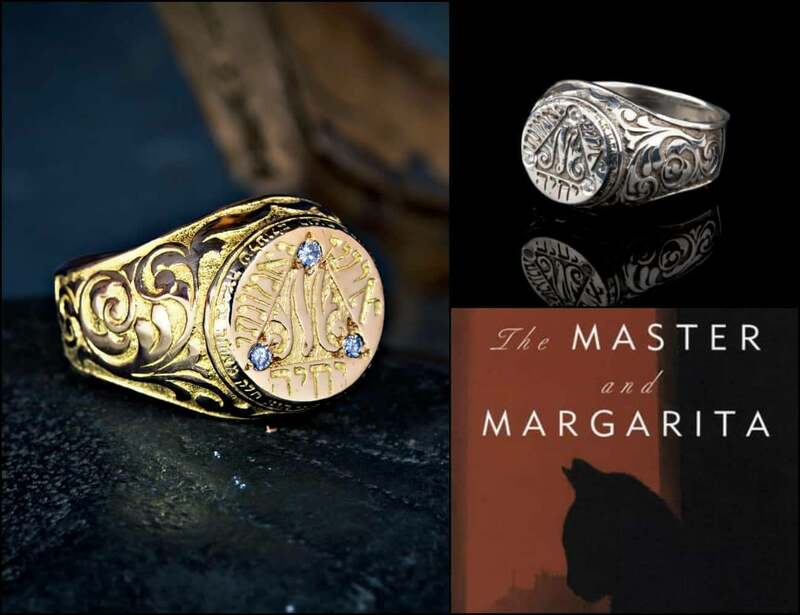 This ring is based on one of the greatest novels ever, the Master and Margarita, by the Russian novelist Mikhail Bulgakov. The M Represent the master. 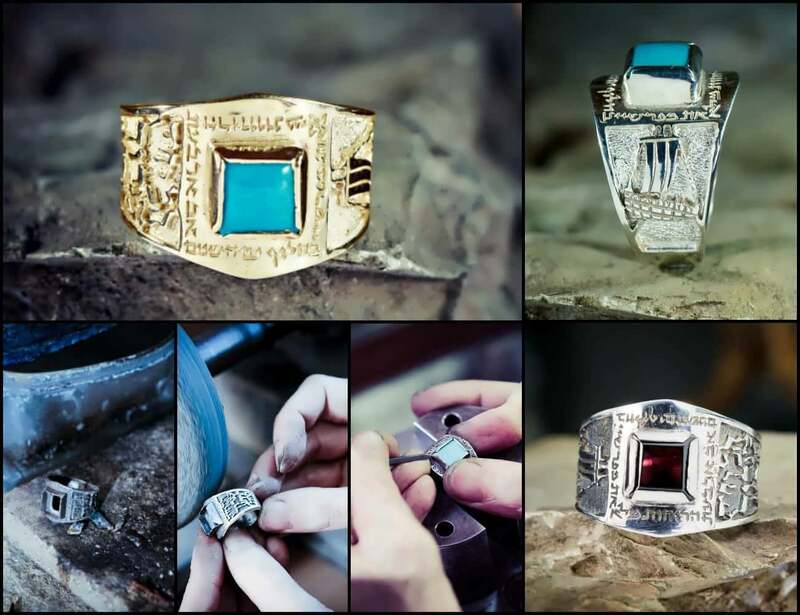 The ring reminds the wearer that he is the creator of his own reality. 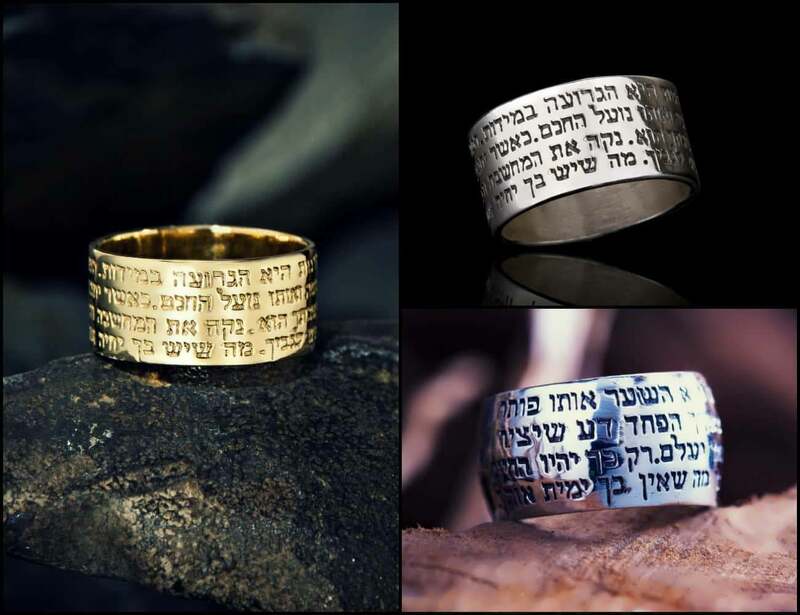 The ring is engraved with the Hebrew quote: " Each will live according to his own belief ". Encircling the ring is a Hebrew engraving of a citation from the book by Faust: " Who are you, then?... I am part of that power which eternally wills evil and eternally performs good ". 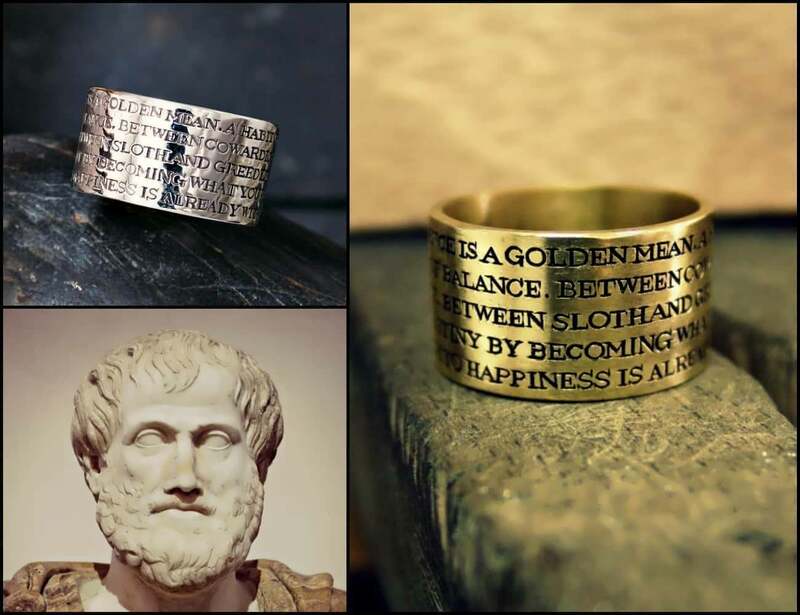 This ring is based on the ancient greek philosopher Aristotle’s perception and ideas of what is happiness and how to achieve a state of complete happiness through balance as well aspiration for excellence. The ring is a constant reminder for the wearer to continuously act towards contemplating the way of excellence.